On a rugged island just offshore from Ventura County, archaeologists have turned up evidence of some of the oldest human activity in coastal Southern California. On Santa Cruz Island, the largest of the Channel Islands, researchers have found three sites scattered with ancient tool-making debris and the shells of harvested shellfish. The youngest of the three sites has been dated to 6,600 BCE, but based on the types of tools found at the other two, archaeologists say they may be as much as 11,000 to 12,000 years old. The artifacts are traces of what’s known as the Island Paleocoastal culture, descendants of migrants who moved south from Alaska along the Pacific at the end of the last Ice Age. These ancient seafaring people were some of the earliest inhabitants of California’s southern coast, said Dr. Jon Erlandson, an archaeologist with the University of Oregon who reported the new finds. “To colonize the islands, they clearly had boats and used them to hunt marine mammals, fish, and birds, and gather shellfish, seaweeds and plant foods,” he said. These ancient islanders left behind no traces of structures, at least that have been found so far, but a subtle abundance of their presence remains, like piles of abalone and mussel shells, unique barbed stone points, and distinctive crescent-shaped tools whose exact purpose remains unclear. Using these and other clues, Erlandson and his colleagues have discovered Paleocoastal sites not only on Santa Cruz, but have also detected dozens of others throughout the Channel Islands. The ancient sites tended to have some kind of natural shelter nearby, as well as access to resources like rock and fresh water, and a commanding view of the island’s coastline. So Erlandson’s team searched for areas on Santa Cruz Island that had all of these attributes, and they found the new sites — right where they predicted. “Initially, we started examining three geographic features we felt would have pulled people away from [the island’s] coastlines that were submerged by rising seas: caves and rockshelters, freshwater springs, and toolstone outcrops,” Erlandson said. “We added overlook sites later as our surveys revealed that they, too, were important. The first site he and his team recorded was high on a bluff looming more than 60 meters above the ocean. 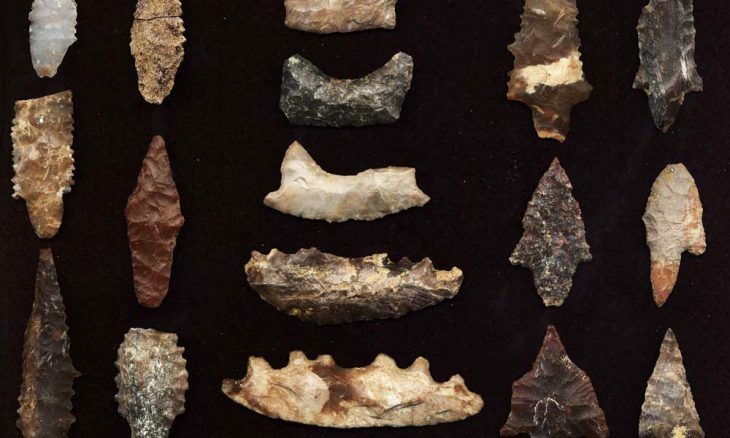 There, the researchers found more than 100 chipped stone artifacts, mostly leftovers from the tool-making process, along with a handful of flake tools and the remnants of the crescent-shaped tool that’s been found elsewhere on the islands. On another nearby bluff, the team then found a matching site, with another hundred-odd bits of chipped stone, another piece of a crescent tool, and a trash pile of cast-off mussel shells that had been stripped of their meat. In addition to providing clues about the Paleocoastal diet, the shells also provided dates for when they were harvested, based on their levels of carbon-14. Lab analysis showed one shell sample to be 8,560 to 8,725 years old. The similarity between these two sites suggests that they served similar functions for the island’s ancient occupants, Erlandson said. “The two coastal sites may have been workshops and overlook sites that were used relatively briefly by Paleocoastal peoples,” he said. Erlandson pointed out that the sites were far from shore — and they had been even farther from the water thousands of years ago, when sea levels were lower during the Ice Age. So the towering height of the sites must have offered some advantage to the ancient mariners, although what it was remains unclear. “We’re still trying to figure this out, but the sites offer commanding views of adjacent shorelines and waters,” Erlandson said. “In some cases, they may have been used to watch where seals and sea lions were hauling out on beaches, or to keep an eye out for other humans. Farther inland, the team discovered a third site, about 5 kilometers from the modern shoreline, on a stream terrace. Erlandson believes this was where, more than 20 years ago, a student found and removed several stone tools, including three crescents — a finding Erlandson’s team sought to confirm. The team first found a few dozen human-made stone flakes in the area, but no specific artifacts that could be tied to Paleocoastal or any other particular culture. 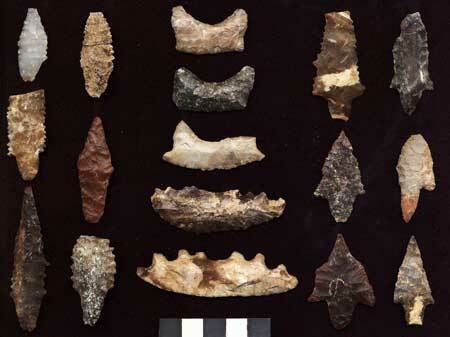 Then, nearby, they found a much denser patch of artifacts, including several biface blades, some chert flakes, and the fragment of a small stone point. Such an assemblage of tools is a lot like those that have been found at many of the older, datable sites elsewhere on the Channel Islands, Erlandson said, and those other sites typically included crescents as well. So that spot is likely where the three crescents had been found, he concluded, and it — along with the first overlook site — are probably some the earliest known sites on Santa Cruz Island. “We haven’t yet found datable organic remains, but I suspect based on the number of crescents that it is among the older Paleocoastal sites on the island,” he said. There’s a lot that remains to be understood about Island Paleocoastal culture, Erlandson said — among them, the precise purpose of those curious, crescent-shaped tools. “I’ve written and thought a lot about crescents,” he said. “They probably had multiple use-lives, but I think they were made primarily to serve as transverse projectile points used in bird hunting, a shotgun approach to shooting at flocks of birds in flight. “On Santa Rosa Island, two stratified sites with crescents have produced numerous crescents associated with abundant bird bones, including geese and ducks. And there’s much else about the deep past of the remote, rugged island that remains to be discovered, Erlandson said. 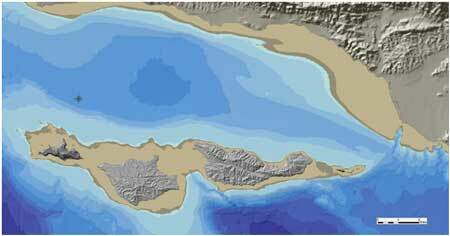 Owing to the fact that sea levels were so much lower 12,000 years ago, many of the sites used by Paleocoastal people are probably now underwater, he added. “We are contributing to a broader understanding of where the first Americans came from, the diversity of their adaptations, and the nature of their lives on the Channel Islands,” he said. “Significantly, because nearly two-thirds of these islands have been submerged by rising post-glacial sea levels, we are looking at the proverbial tip of the iceberg. Erlandson and his colleagues report their findings in the journal Paleoamerica. Could the crescents be clam shuckers? I’ve shucked both clams and oysters, and I don’t see how a shucker would benefit by being crescent-shaped. With any bivalve you have to either pop the shell at the hinge while it’s raw, or bake it til it pops open, or (if no other tools are available) crack the shell with the equivalent of a hammer. As a kid growing up in NW Florida I shucked innumerable oysters with a home-made oyster knife that had been ground down from a metal file; you slip the tip into the hinge, twist it, and the shell pops free. I don’t know how large the crescents are. If they are of appropriate size, I’d suggest they might be fishing lures. Crescent-shaped stone lures were used by Indians in the Klamath Basin of Oregon. If I remember correctly, Nanook of “Nanook of the North” used a crescent-shaped stone lure. I watched that movie many times when I was a substitute teacher! The crescents occur throughout the desert west associated with pluvial lake shorelines. They also appear in interior California, most notably around the Tulare Lake basin, which was arguably the last surviving pluvial lake before it was largely drained to grow cotton. Tulare Lake also produces a truly odd object in numbers that aren’t matched any where else – bipointed, unifacially worked forms, mostly of chert, known as “humpies” or “slugs” – they resemble an old-world paleolithic form known as a limace – French for “slug” I understand. Perhaps the crescents were fish scalers? Let the experimental archeologists in to see what they could be used for! Amino acid residue analysis links the crescents to water fowl and to jack rabbits in the Great Basin. I too have been wondering about the crescents. These people hunted seals, correct? Seals have a heavier fat-layer beneath their skin than most animals; I’ve helped scrape deerskin in the past and a flat scraper worked fine, but for something with a rich, heavy fat-layer, would working the skin over the curve of a wooden log with a curved scraper be easier? Just a thought. I wonder. Did the heights give them a commanding view of the seasonal whale migrations? They were a sea going culture, They incorporated all manner of seafood into their diet, natives on the Olympia coast were harvesting whales during migration well into the last century. Whale hunting by Eskimo’s is/was practiced too. Was it was a hunting strategy? if anyone is interested i found a burial site in smugglers cove about 35 yrs ago and have some abalone jewelry, piece of a skull and a black stone ball aprox 3″ with a hole aprox. 1″ thru it. i was on santa cruz island doing salvage work on a wooden boat that had washed up on the beach, we were digging a trench to bury a log as a deadman when i started seeing bones and stuff, tried to get someone at ucsb interested in it 10 or 15 yrs ago but never heard back. if you would like pics of the items let me know. read the artical about the 11,000 yr old seafarers and remembered i had them packed away. thought they were chumash when i found them now i don’t know. I would love to see pictures of what you found. Sad that you couldn’t get anyone interested in checking it out long ago. They are Chumash, at least the ancestors of the Chumash. The Archaeological record of Santa Rosa, Santa Cruz and San Miguel show Continuity of the Chumash People, and there is not one Archaeologist or Anthropologist who thinks that the Chumash haven’t been there from the start. They are too imbedded on those islands for them to be different from the ancient ancestors. The Chumash Natives were Matrilocal , so the men the woman married came from the mainland. They were very careful to not marry relatives.